Ethnicity and identity are fluid concepts. Much more fluid than you might think and with a reach that goes beyond borders. Even though the Latin American interpretation would be more indigenous, think Cholo and, if you´re from the US, you will conjure up ideas of baggy khaki shorts, white wife-beaters and tattoos with Catholic imagery all rolled up in a Latino gangster or pseudo-gangster look. Now, not all Cholos are low riders but more importantly when you think of low riders you think Mexican in LA, you certainly don’t think Brazilian living in São Paulo. 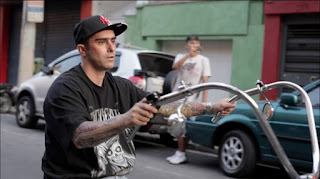 But subcultures sometimes move fast and move far and, believe it or not, in São Paulo there is a small but growing group of self-styled Brazilian cholos on oversize handlebar bikes or custom-made low-riders. More fascinating still, is that the subculture has not leaked down the continent, as you might expect, from Mexican-Americans to Portuguese speaking latinos, it went via Japan. The current street culture in São Paulo can be traced back to Japanese immigrants in the 1990s who came to join the already huge Japanese community in São Paulo and introduced low rider culture. South American Cholo is a documentary that takes a look at São Paulo's low rider culture and in it Sergio Hideo Yoshinaga, 43, the owner of a garage in São Paulo where many retro cars are turned into low rider monsters, explains how he was one of the Japanese pioneers of the movement admiring the aesthetics of the Japanese low rider offshoots and taking the concept to São Paulo. The Brazilian interpretation is just that, an interpretation, adapted to São Paulo, not just an imitation of Mexican-American street culture. As such it provides insights about how fashion spreads, the meaning of identity for both the low rider himself and for São Paulo, his city.